Inventor of the nO-Ring® waterproofing process, Mauron Musy finds its inspiration and technological expertise in the heart of the Broye valley, Switzerland. In 2012, after more than twenty years of experience in working with the most prestigious brands, Eric Mauron and Christophe Musy decided to join forces to write their own watchmaking history. Both are lovers of perfection and share the same passion for micro-mechanics and the art of watchmaking. 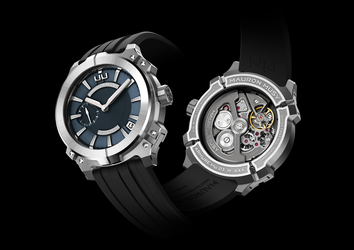 The robust and sophisticated new ARMURE MU03 is a little piece of Switzerland. Rooted in an age-old tradition yet resolutely looking to the future, this “Swiss Crafted” certified model embodies the very essence of the land of watches.